Forgive me for posting old news, but I want to make sure I say something about this before it’s too late. Seattle-based print shop and artist network PrintZero Studios has posted their sixth open call for an international print exchange. If you’re an artist anywhere in the world working in print media (etching, lithography, silkscreen, woodcut, etc.) and you want to participate, you have until May 15 to finish an edition of 15 prints. Full prospectus may be downloaded here. PrintZero Studios is an organization founded by Seattle artist Brian Lane and current Ohio University MFA student Jeremy Cody in 2003. When Brian isn’t organizing print exchanges or building print shops from the ground up, he’s taking several trips a year to New Orleans, where he has been involved in volunteer rebuilding and relief efforts since 2006 (yes, there is STILL work to do.) Brian is also an accomplished photographer who has shown at SOIL and Gallery 4Culture. His love of New Orleans, photography, and keen eye for ironic signage collide in this strange and wonderful Flickr set of too-good-to-be-true protesters swimming against the tide at Mardi Gras. Brian Lane. 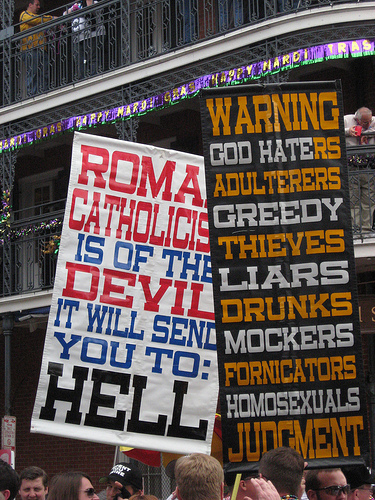 Jesus Signs, Mardi Gras 2009. ~ by emilypothast on April 8, 2009.